Some historical research may be difficult to connect to current debates, but in the case of our research on the UK in the 1960s, recent events have made this easy: Many of the people caught up in the “Windrush” scandal first arrived in the UK during this period. State expectations about proof of identity and internal checks have shifted substantially since then, evolving into today’s “hostile environment.” So, I welcomed the invitation to share some of our research, under the title “The Home Office’s Approach to Managing Migration in the 1960s,” at the Home Office itself, through History and Policy’s presentation programme there. I went to the Home Office not knowing what to expect but I found a very engaged audience who clearly saw the resonance of policymaking deliberations in the 1960s to today’s issues. Perhaps unsurprisingly, a large part of the presentation focused on description. People wanted to know how the immigration system in the 1960s operated completely at the ports, with nearly no internal enforcement to speak of, and on the basis of little documentation and proof of identity. As I have argued elsewhere, this carries clear implications for the kinds of documents these people can reasonably be expected to have 50 years later. First, I pointed out that the relative lack of documentation and bureaucracy in the Commonwealth immigration system in the 1960s was not an accident or oversight, but rather, quite deliberate. Discussions of previous UK immigration regimes – which often appear strikingly lenient compared to today’s – often carry a tone that portrays them in a quaint or even naïve light. It is easy to lose track here of what our archival research shows: that officials designed a light-touch system for Commonwealth immigrants for purposeful and interlinked reasons that we must bear in mind today. The Home Office considered this population permanently settled, was concerned about their integration, and thought intensive internal checks would hinder this. They wanted to encourage family reunification of already-settled migrants, and thought that bureaucratising the system with pre-entry checks and document requirements would lead to draconian denials at the ports. They wanted to preserve a meaningful advantage to Commonwealth citizenship, and refraining from visa requirements was key to this. They knew what a more intensive system would look like: they had these kinds of individualised checks in place in the separate system for “aliens” (non-Commonwealth foreigners). But they believed that these checks would be resource-intensive and counterproductive for Commonwealth immigrants. The document-light system of the 1960s was no accident; it was always supposed to be that way. One slide from the Home Office presentation. Second, Commonwealth immigrants arrived first – the concept that a Commonwealth immigrant could be “illegal” was invented later. The system set up by the Commonwealth Immigrants Act 1962 capped the number of new primary labour migrants, but did not make it an offence to subvert immigration controls. The Act was not intended to police individual transgressions of the rules. As Christina and I have written, only in 1968 did entering outside a port become an offence, and even then, the Home Office regarded the change as symbolic. Court rulings did not expand the definition of “illegal entry” to include other forms of evading controls until the 1970s. The upshot is that immigrants before this time arrived under a regime where their right to stay was very secure: they were not scrutinised by internal checks, and the idea that Commonwealth citizens could even be “illegal” was not part of the control system. It is natural that this administrative posture would encourage a more relaxed attitude toward proof of status than we might expect under a different system – similar, perhaps, to EU citizens who arrived in the UK before the spectre of Brexit was raised. Finally, I sought to highlight the contrast between the policy goals of policing individual transgressions of immigration rules, and controlling immigration numbers. Today, these are rarely distinguished. We are accustomed to the continually unmet “net migration target,” and the Home Office’s attempts to meet this through an ongoing tightening of the immigration rules. These do not (except in certain work migration categories) create caps, but rather, establish levels of qualification for individuals to immigrate to the UK. The Home Office of the 1960s regarded these two types of immigration governance as very different, and at odds with each other. Officials saw that a design focused on individual qualification did not necessarily restrict numbers, which is one reason they resisted governing Commonwealth migration in this fashion. With respect to Commonwealth immigration, the Home Office’s chief goal was to reduce inflows, so they created a cap on new work vouchers, and saw catching possible “evaders” as marginal. 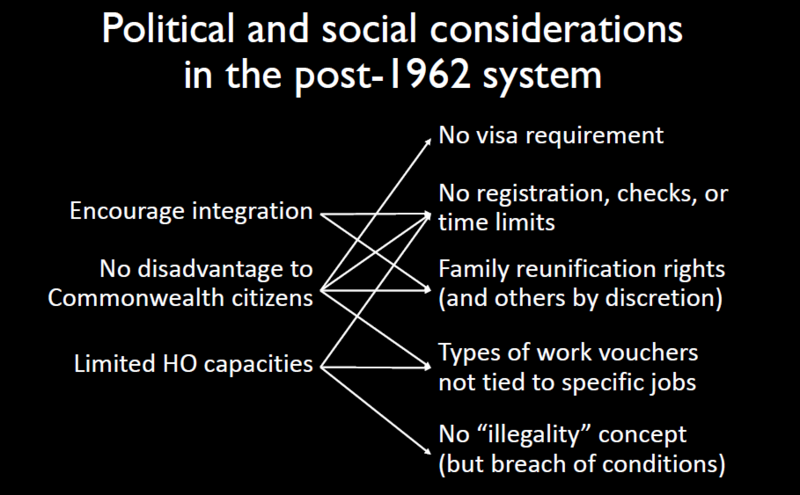 Over the course of the 1960s, the Home Office found that the basic architecture of the 1962 Act did, in fact, give them the tools to reduce immigration – but also that their pursuit of this policy goal often did not match how immigration was politicized. In the 2010s, the Home Office has found reducing inflows through individualised scrutiny to be an unsolvable puzzle – while migration debates are, evidently, less about degree than kind. The “Windrush” scandal has given renewed importance to the voices of officials, long buried in the archives, who in their own time urged caution in attempting to police immigrants. This also holds a valuable lesson in the context of Brexit. The experiences of the 1960s remind us that we must think of immigration systems in the long run: an EU citizen child today may well live for nearly a century under British immigration regimes, which should not change in ways that are incompatible with these people’s initial entry to the UK under free movement rules. If nothing else, I hope my presentation may have a positive impact on how people within the Home Office approach these issues in the future.